You are currently viewing Version 1. V1 of the API will be maintained for the time being, but any new features and development will be on Version 2. We encourage you to do any new development with API V2. Check out the Python Verify V2 Quickstart for more information. This quickstart guides you through creating a Python, Django app that requires a Phone Verification step to create an account. Two channels of Phone Verification are demoed: SMS and Voice. Once logged in, visit the Verify Console. 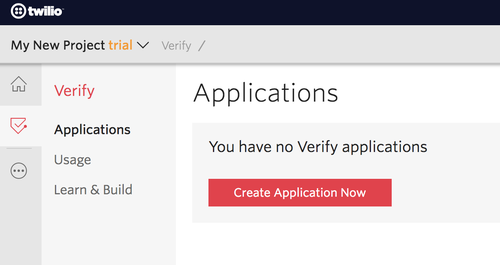 Click on the red 'Create New Aplication' (or big red plus ('+') if you already created one) to create a new Verify application then name it something memorable. Enter the API Key from the Verify console and optionally change the port. You'll either receive a phone call or an SMS with the verification token. If you requested a phone call, as an additional security feature you may need to interact to proceed (enter a number on the phone keypad). Your demo app is now keeping fraudulent users from registering with your business and polluting your database. Next, check out all of the variables and options available to you in the Phone Verification API Reference. Also, to protect your customers in an ongoing manner (with this same codebase) try the Python Django Authy Two-Factor Authentication Quickstart. After that, visit the Docs for more Account Security demos and tutorials and web applications using all of Twilio's products.